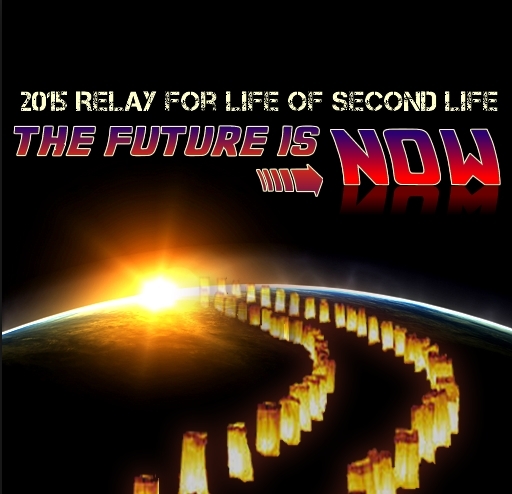 Saturday, May 16th and Sunday May 17th officially mark the Halfway There weekend for the 2015 Relay For Life season in Second Life. As is usual for the half-way stage in the season, a full weekend of activities has been planned, including fund-raising, DJs sets, tribute bands, and many RFL of SL Relay Team events, with everything kicking-off from 16:00 on Saturday, May 16th, and then running through until the evening of Sunday, May 17th. Four regions have been set-up for the weekend, and they draw upon this year’s Back to the Future-esque theme for their inspiration. So, throughout the Halfway There festivities, you can travel back to the Pac-Man dominated 1980s, or tour the 1990s, reminisce over the 2000s, and look ahead to a hopefully eco-friendly future. Each region has its own stage area, and all four are connected by a central hub area which offers a main stage for key events. The SLurl for arrivals is given at the end of this article, but please note it will not be open until just before the weekend is due to kick-off. On Sunday, May 17th in particular, the event will feature the Halfway There Awards ceremony, which will take place at 10:00 on Sunday, and will include the 2015 Relay For Life of Second Life Planning Committee.